Garmin nuvi 465T has been designed for truck drivers. Featuring a 4.3-inch touchscreen and European road maps, the nuvi 465 truck sat nav can calculate the shortest route between two or multiple destinations. What's more with it being a sat nav speciaffically for trucking it will take in to account the dimension of your vehicle and avoid low bridges, narrow roads etc. The nuvi 465T also features a FM traffic receiver which provides free traffic information, Lanes Assist and provides speed limits specifically for your truck. Optionaly you can also subscribe to speed camera location warnings provided by Cyclops. Garmin nuvi 465T has been discontinued. Accessories, spares and parts are still available for your nuvi 465T as are street-level road maps. Garmin nuvi 465T is the premium sat nav designed by Garmin specifically for trucks. The nuvi 465T comes preloaded with European mapping and features a 4.3-inch TFT touchscreen display. The nuvi 465T can also save multiple truck profiles so this device can be moved between multiple vehicles, as well as cater for different types of load. The Garmin nuvi 465T calculates truck friendly routes. Simply enter the vehicles height, weight, length and width and then when you input your destination the route chosen by the sat nav will avoid low bridges, narrow roads, etc. You can enter multiple destinations and the Garmin nuvi 465T will work out the most direct route that is most economical. There are also truck-friendly points of interest programmed into the system and you can store 1000 waypoints. 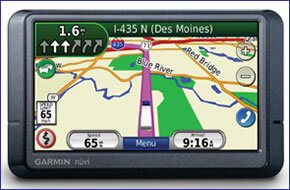 Garmin 465T sat nav will speak street names and provide turn-by-turn directions. A great feature it has is Lane Assist which will ensure you get in the correct lane at junctions. Additionally along with the truck attribute database you will receive voice prompts for sharp bends, steep gradients and when the road width narrows. The road speed limit is also displayed for most major roads throughout Europe. Plus you can locate the nearest petrol station. The Garmin nuvi 465T includes an FM traffic receiver. This will provide information on road congestion so that the sat nav can help you avoid being caught in traffic. It also includes a lithium ion battery with a battery life of 4 hours. The Garmin nuvi 465T, like all Garmin sat nav's, gets its speed camera data from the Cyclops speed camera database. The database provides advanced alerts to fixed, average speed, mobile, variable, temporary roadwork, red light and red light speed cameras. As you approach a camera, your device sounds an alert. Subscription charges apply. Click here to read more about the Cyclops speed trap database. The Garmin nuvi 465T has been designed to be plug and play, and as such can be transferred from vehicle to vehicle with ease. The Garmin nuvi 465T is powered via the supplied vehicle power cable which includes an integrated GTM 21 FM traffic receiver for real-time traffic updates. The Garmin nuvi 465T then attaches to your vehicles dash via the Garmin nuvi 465T dash mount. Garmin nuvi 465T comes preloaded with detailed City Navigator street maps for the UK, Ireland and Western Europe (22 countries) provided from map supplier NAVTEQ. Rolling screen transition, accelerated map redraw and routing capabilities make screen zooming even smoother and ensure the navigation always matches your pace. Looking for accessories and spares for the Garmin nuvi 465T? View the full range. All parts are genuine Garmin product and specifically designed for use with the nuvi 465T. Accessories available to purchase include a 4.3-inch carry case, mains power charger, a weighted dashboard mount and a traffic receiver. Along with these accessories, it's also possible to buy replacement parts such as suction cup mount and vehicle charger. View all of the nuvi 465T accessories here. Question: Will SD map of North America fit my Garmin nuvi 465t sat nav? Answer: Yes, the Garmin City Navigator NT Maps of North America microSD/SD card is fully compatible with the Garmin nuvi 465T. Please note: the mapping may not include specific truck information. Do you have a question about the Garmin nuvi 465t? Submit your question via our contact page.